This birthday party themes is sure to be a hit for anyone who loves the Avenger movie or the comic books! 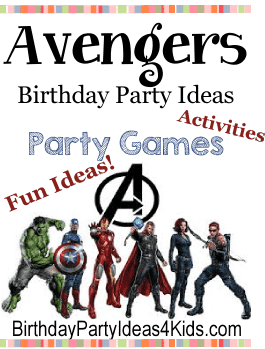 Fun Avenger themed birthday party ideas for decorations, birthday invitations, games, activities and more! Make a Captain America shield and hang it up as a target. Give each child a water gun and have them shoot the target to see who can reach the star. To make this game more competitive, have the kids take a few steps back after each round to see who is still able to hit the target. Create Thor’s Hammer with a Kleenex box, paper towel roll, duct tape, and electrical tape. You might also want to put something small inside to weigh it down. Hang a hula hoop and have the kiddos try to throw the hammer through the hula hoop. Players try to be the first one to free an Avenger figure from a block of ice. A day before the party, fill two large containers with water and put into the freezer. They need to be similar sizes. Once a few hours have passed, add a small figurine to each container so that it is in the center. When it is time for the game, divide all of the guests into two groups and supply each one with a water gun. Put a block of ice about ten feet or so in front of each of the groups. Have the kids shoot their block of ice with the water guns until the figurine is free. The first team that frees their figurine wins! Blow up green balloons halfway with air. Tie one balloon to each child’s ankle with a string (about two feet long). When you yell go, each child has to try and stomp on everyone else’s balloon to pop it. The last child with a balloon wins! To make this even more fun, have each child yell ‘Hulk smash!’ whenever he/she stomps on a balloon. Guests have to guess how many pieces of candy are in a jar. Before the Avenger Birthday party place candy in a large see through container. Count how many pieces of candy you place in the jar and write down the number to save for later. Put the large container of candy at the entrance of the party. Have each guest use their superhero powers to guess how many pieces of candy are in the container. At the end of the party, announce who was closest to the correct number and let them take the candy home! Put small ice cream cones on a baking sheet. Give the child a hulk fist and have them use it to smash the cones. On each child’s turn, give them a hulk fist and have them hit an Avenger’s themed piñata. Give each child a toilet paper roll to decorate with materials such as colored paper, markers, and stickers. Cut a slit down the middle of the back of the roll so the child can put it on his/her arm. They have just made their very own superhero cuff! Blow up balloons and hang on a string to make rows of garland for decoration. Cut long triangles out of comic book pages. Spacing them a few inches apart, sew them onto a thick piece of string. Hang your cool new bunting all over the birthday party! On the front of the invitation, put ‘Avengers Assemble!’. Put all of the party information onto the back. Include on the invitation for the guests to come dressed as their favorite Avenger! Make green punch and label it ‘Hulk Punch’. Put pretzel sticks into cubes of cheese to create ‘Thor’s Hammer’. Make Captain America’s shield by putting strawberries in the center of the tray. Lay blueberries around the strawberries, then put raspberries, bananas, and finally more strawberries. Cut a star out of thick white paper and put it on top of the center of the tray. Mix red and blue or yellow and red M&M’s into a bowl of puppy chow snack mix. Before the party make or buy cupcakes with white frosting. Set up a cupcake decorating station and let each child choose from different colored candies to make their own Captain America cupcake, Iron Man cupcake, Hulk cupcake, etc. Dye white chocolate different colors-red, yellow, blue, and green. Dip finger foods such as pretzel rods, Rice Krispies, and graham cracks into one of the colored chocolate. Let these dry and then they are ready to serve! Give out pencils, glow sticks, and small bags of colored M&Ms as party favors. Avenger stickers or washable tattoos are also a fun idea. Use a large plastic kid’s Avenger’s cup to hold party favors. Wrap party favors up in tissue paper and tie with a red and blue ribbon and place in the cups. Use red or blue paper bags to hold the Avenger party favors. Punch 2 holes in the top of the paper bag and thread ribbon through the holes and then tie in a bow. Encourage guests to come dressed as their favorite Avengers character! Have a family member or friend set up a face painting station where each guest can get his/her face painted like an Avengers character. Set up a photo booth at the birthday party so that all the party guests can have their picture taken in their costume. Provide props for the guests to use in their photos such as a large Thor hammer, Hulk fist or Captain America Shield.